CannaWell's Hemp Balance is organically certified. It is made from outdoor grown hemp, cultivated in pristine, healthy soil and is blended with nutritious organic hemp seed oil. The 2.5% is a regular strength supplement, ideal for daily use and to support your body's endocannabinoid system. 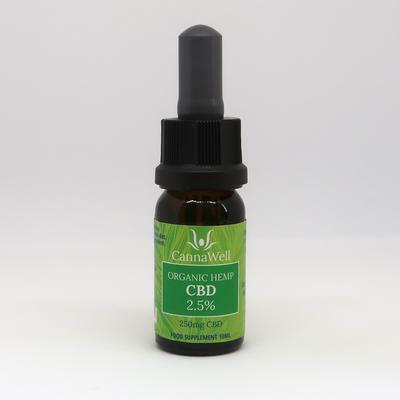 Whether you want to try a CBD oil for the first time or have come to love hemp and wish to take a real quality food supplement, then you may be pleased with CannaWell's Hemp Balance 2.5%, it is our most popular product. The Hemp BALANCE is vegan, gluten free and organically certified. 5 drops contain 4.5mg CBD/CBDA , take 1-3 times per day. Everyone is unique. We therefore encourage everyone to experiment with the number of drops that works best for you ! The bottle should be stored in a cool dry place away from direct sunlight, or can be refrigerated. - nothing else, 100% organic. 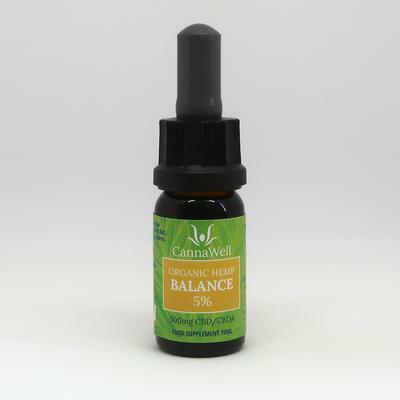 The Hemp Balance is made from using the whole plant and careful CO2 extraction delivers a so called full spectrum hemp extract. This means the hemp extract contains much more than just CBD and CBDA , it also has traces of other cannabinoids such as CBG, CBC, CBV and many other phyto-cannabinoids. There are also many other types of natural molecules present such as amino acids, carbohydrates, vitamins (including B1, B2, B6, D), fatty acids (including omega 3 & 6), trace minerals (including iron, zinc, calcium, magnesium, potassium), beta-carotene, chlorophyll, flavonoids, ketones, nitrogenous compounds, alkanes, glycosides, pigments, water, and terpenes. The most common terpenes in our hemp extracts are Myrcene, Beta-caryophyllene, Terpinolene, Linalool, alpha-Pinene, beta-Pinene, Nerolidol og Phytol, trans-alpha-Bergamotene, Limonene/ beta-Phellandrene (Co-elution), and alpha-Humulene.